Hello? Is anybody out there?? For now, we will ignore the date on this post as it compares to the date on the previous post in order to introduce you to my newest pattern: The Knitspiration Hat. This is a little something that has been in the works for a few years now, and I’m excited to finally share it with other knitters. As you may know, I have been home with my kids, as a full-time, stay-at-home-mom for three years now. Now that I have multiple children in school, I always seem to be scrambling to find the perfect teacher gifts this time of year. Teachers give so much to our children; cultivating their lives daily, helping them grow and learn when parents are not around. I would love to be able to lavish them all with expensive gifts and Starbucks trips and Target runs, but our budget doesn’t allow for that these days (plus I have a way to get my kids involved… keep reading!). This pattern was born out of necessity, using resources I have: time/desire to knit, lots of yarn… and lots of “help”. Each year, for the past few years, I have drawn out a picture of a plain knit hat, having my kids color it in with a design from their heart (along with a little guidance from mom). I then interpret their “designs” into a hat for these important people who pour so much into their lives. And now, after much tweaking and input, I have a way to share this concept with you! You start with the card template, shown above. Your child (or even you if you would like to tackle the project solo) “designs” the blank hat. There are colorwork charts in the pattern to get you started, but the sky’s the limit. If you don’t feel comfortable with colorwork, get out your stitch dictionary to incorporate cables, lace, or texture. Interpretation is up to you! A blank workspace is included for you to plot out your design, stitch by stitch, along with three different options for crown decreases. The Knitspiration Hat is now available for download on Ravelry and because I would love to help you all feel “knitspired” this holiday season, I am offering the pattern for free for the first 2 days of launch. So who inspires you? A teacher? Grandparent? Aunt? Uncle? Mentor? I’d love to see what you come up with. 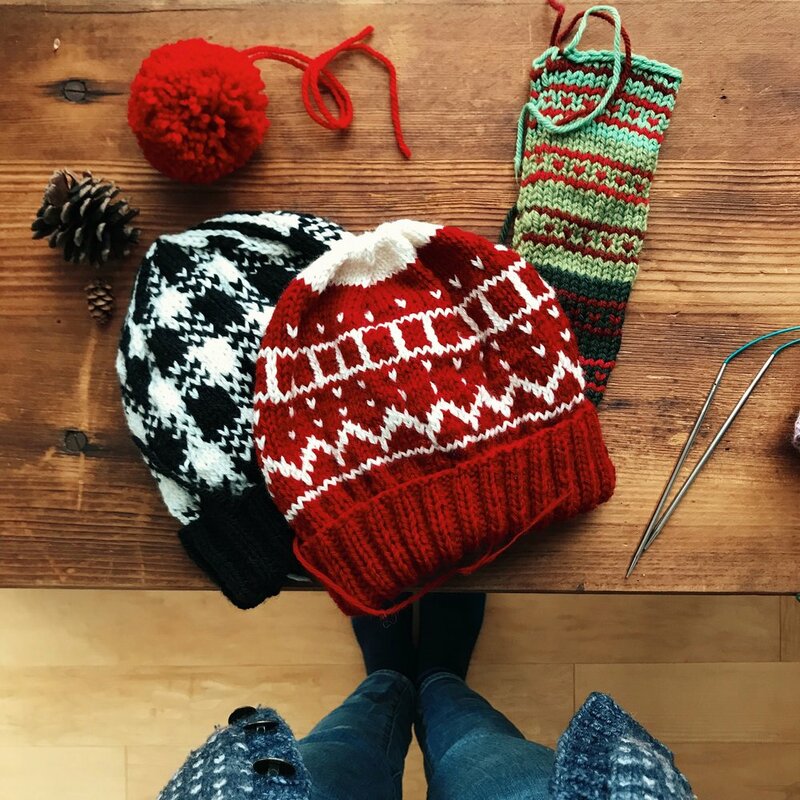 Tag your project on social media with #knitspirationhat to share your ideas with others and tag me @frenchpressknits on Instagram to get featured! My 2018 teacher gifts are underway and I’ll be sharing more specifics soon!